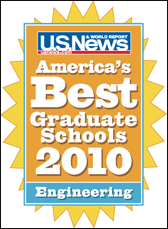 The Clark School's graduate program maintained its ranking in the 2010 Edition of "America?s Best Graduate Schools" published by U.S. News & World Report. The Clark School is listed at 17th in the nation overall; among public university programs, the Clark School ranks 9th in the nation. Regionally, the Clark School is third among all East Coast schools and 1st among public mid-Atlantic schools.